Please visit my Sandwich Recipes for more ideas. Add maida and mix well,then add cold milk. Now add processed cheese,red chili flakes,black pepper powder ,salt & Italian seasoning and mix well. Turn off the flame and let it cool completely. 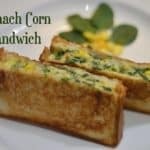 Spread creamy spinach corn mixture on one side of bread ,add some more grated cheese on top. Then cover with another slice of bread. Either grill or toast the sandwich on both sides on tawa with some butter. 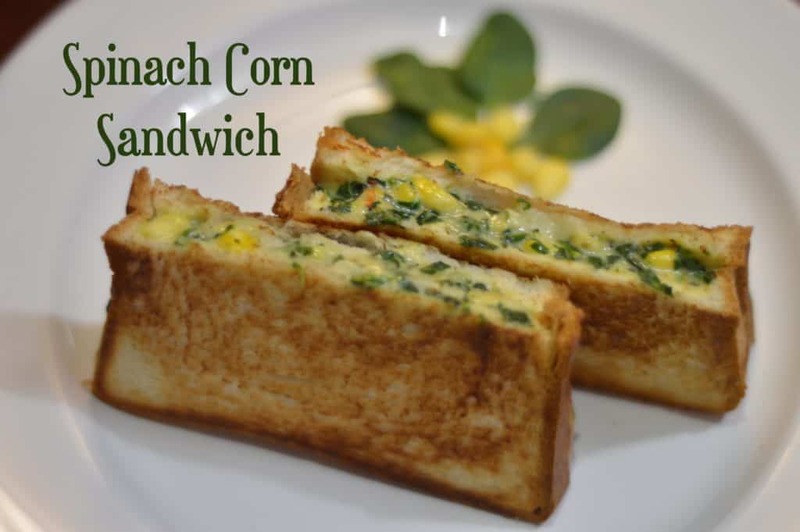 Cheesy spinach corn sandwich is ready to serve. 1.I have used white bread here. You may use any bread of choice. 2.You can use cheese slice if you do not mozzarella cheese. 3.Spinach Corn mixture can be stored in refrigerator for a day or two and can be used to make sandwiches whenever needed. Indian Veggie Delight is all about exotic Indian vegetarian recipes. Food is my true love and cooking is my all time passion.